Donald Trump Jr. and Texas hedge fund manager Gentry Beach have long claimed they're just friends. But Trump Jr. has a previously undisclosed business relationship with his longtime hunting buddy who helped raise millions of dollars for his father's 2016 presidential campaign and has had special access to top government officials since the election, records obtained by The Associated Press show. The president's eldest son and Texas hedge fund manager Gentry Beach have been involved in business deals together dating back to the mid-2000s and recently formed a company — Future Venture LLC — despite past claims by both men that they were just friends, according to previously unreported court records and other documents obtained by AP. Beach last year met with top National Security Council officials to push a plan that would curb U.S. sanctions in Venezuela and open up business for U.S. companies in the oil-rich nation. Ethics experts said their financial entanglements raised questions about whether Beach's access to government officials and advocacy for policy changes were made possible by the president's son's influence — and could also benefit the Trump family's bottom line. "This feeds into the same concerns that we've had all along: The really fuzzy line between the presidency and the Trumps' companies," said Noah Bookbinder, who leads Citizens for Responsibility and Ethics in Washington, a public policy group. "Donald Trump Jr. sort of straddles that line all the time." It's not the first time Trump Jr. has attracted questions about mixing business and political access. Earlier this year, he traveled to India to meet promoters and buyers of Trump brand luxury homes in that country, raising ethical concerns about using the name of the American president to promote business ventures overseas. At the time, Trump Jr. said discussion that his family is profiting from his father's presidency was "nonsense." Last February, just as Trump Sr. was settling into office, Beach and an Iraqi-American businessman met with top officials at the National Security Council to present their plan for lightening U.S. sanctions in Venezuela in exchange for opening business opportunities for U.S. companies, according to a former U.S. official with direct knowledge of the proposal. Career foreign policy experts were instructed to take the meetings, first reported last April by the website Mic.com, at the direction of the West Wing because Beach and the businessman were friends of Trump Jr., the official said. The official, who spoke on condition of anonymity to discuss sensitive government work, said that inside the NSC lawyers raised red flags about the appropriateness of the meeting. The U.S. didn't act on the pitch, which would have gone against the president's hard-line stance on the South American nation and its president, Nicolas Maduro. Seven months after the Venezuela meetings, Beach attended a private lunch in Dallas between Interior Secretary Ryan Zinke and Republican donors, including businessmen with petroleum interests, according to a copy of Zinke's schedule. The Interior Department didn't respond to a request for comment about the meetings. A White House official said Trump Jr. didn't arrange Beach's visit to the NSC and his proposal was dismissed. In a statement, the Trump Organization said Trump Jr. has never played a role arranging meetings "with anyone at the White House or any other government agency." Alan Garten, the Trump Organization's general counsel, acknowledged that Trump Jr. had invested with Beach in the past, but referred AP to a statement released by the company in April, which said their relationship was "strictly personal." In a statement provided by a friend, Beach said it was "absolutely not true" that he'd ever "used my longtime personal friendship with Donald Trump Jr." to influence government decision making. According to his friends, Beach, who has known Trump Jr. since they attended the University of Pennsylvania together in the late 1990s, developed his own relationships during the campaign and inauguration and doesn't need Trump Jr. to broker introductions. Beach was an avid fundraiser and campaigner for President Trump, particularly in Texas, where Trump Jr. told donors last March that Beach and another longtime hunting pal, Tom Hicks Jr., raised millions for his father's campaign, according to the Dallas Morning News. After the election, Beach served as a finance vice chairman for the inaugural committee and faced scrutiny after a nonprofit he started at the time advertised hunting and fishing trips with Trump Jr. and his brother, Eric, to million-dollar donors. Last October, Beach incorporated a business called Future Venture LLC in Delaware without listing any Trump connection, signing himself as the entity's agent. 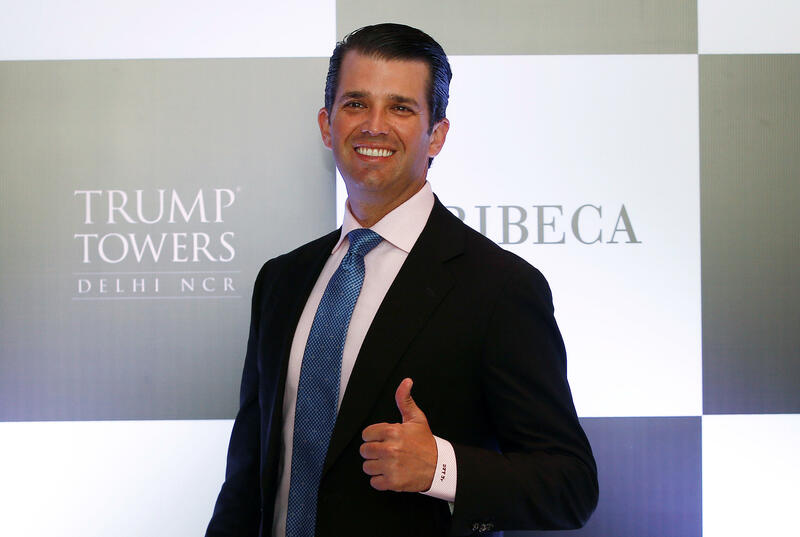 But a disclosure report filed with New York City officials and obtained by AP via a public records request shows Trump Jr. is named as the president, secretary and treasurer of the company. The purpose of the limited liability company could not be determined from the filings. The Trump Organization said it was set up to pursue technology investments. Previously unreported court documents show that the two men, each a godfather to one of the other's sons, did business together well before they formed Future Venture. In a 2010 deposition, Trump Jr. testified that he had twice made investments in ventures that Beach had an interest in: $200,000 in a dry Texas oil well managed by Beach's father and an undisclosed amount in a failed mining stock affiliated with Beach's uncle. In August 2008, while the two men were golfing together in New York, Beach suggested Trump Jr. sell his shares in the tanking stock "if you need the tax loss," according to a copy of his testimony filed in a long running civil lawsuit between Beach and a former employer, hedge funder Paul Touradji. Beach's father, Gary Beach, was convicted last month of federal bankruptcy fraud after a seven-day trial in Dallas. Trump Jr. testified that he had other business discussions with Beach — but not all of them came to fruition, including a plan to buy a hunting preserve in Mexico with Beach. Trump Jr. also referred Beach to someone he knew from Saudi Arabia when Beach was working on a potential oil purchase and invested $50,000 along with his sister Ivanka in an Argentine resort developed by one of Beach's friends, he testified. Trump Jr. estimated he exchanged roughly 500 emails with Beach at the time of his 2010 deposition. Pressed for details about the oil well deal in his deposition, Trump Jr. indicated he wasn't well versed in the oil-and-gas business. "You know, I put some money with a friend," he testified.